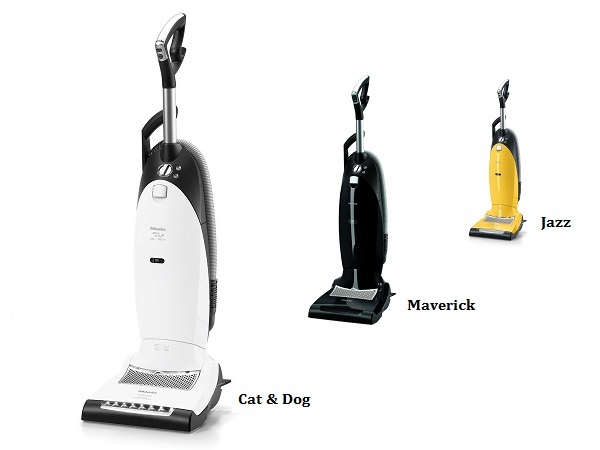 The U1 series from Miele has many qualities that you would expect from a full sized upright vacuum cleaner. However, there is one that you wouldn’t even think about but certainly sets it apart from the competition. The double SwivelNeck™ feature enables you to easily steer the machine with a quick turn of your wrist. This solves a big problem that large, heavy cleaners have as they are typically hard to maneuver around the many items in your home. The U1 makes this process almost seamless while also allowing you to extend it down to where it is virtually flat to the floor. Cleaning under your bed has never been easier. Miele is usually known for canister vacuums but they do have a few top-notch uprights in their lineup. The suction power is supplied via their well known 1200 watt Vortex motor but there also is a 4,800 rpm motor that spins the “Power Brush” electrobrush. This dual motor setup keeps the suction steady as their is no slowdown when thicker carpets are encountered. The Vortex can focus on pulling the dirt and debris up while the brush motor works to spin the brushroll at a high speed. Together they power everything the U1 needs. Another feature that is equally important for a full sized vacuum, one that is intended for cleaning multiple rooms and surfaces, is a quality filtration system. The Miele multi-stage unit is made up of their Auto-Seal™ HyClean dustbag which immediately closes upon removal to lock in any dirt that has found its’ way inside. The Air Clean filter contains multiple layers to trap 99.95% of the smallest of allergens down to 0.5 micron in size. There is also a single pre-motor filter to keep the main Vortex motor in peak operating condition. All of these filters work in conjunction to effectively remove the dust mites, dander, and pollen from the air before it passes back into your house. The Dynamic U1 is recommended for all pile carpets, from high (plush) to low. You can also use it for area rugs as well as smoother floor surfaces like tile, linoleum, laminate, and wood. This is accomplished by turning down (or off) the suction power via the rotary dial. If you have a normal to large sized home with at least some rooms with carpets then the U1 is a great choice. It has unmatched maneuverability and is flexible enough to handle just about any type of surface that needs to be cleaned. The AirClean sealed filtration system is one of the best in the industry, capturing more than 99% of dirt, dust, and other allergens from the air. It provides consistent cleaning and is built to last for many years. It even comes with a 7 year motor and casing warranty which is far superior to most of the competition. If you want to read more about it and check current online prices, click here to visit our recommended online store.